Ashley is a multi-sport athlete at M.E. 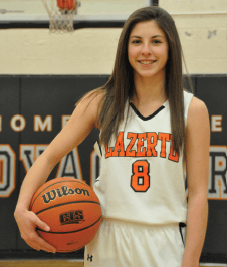 LaZerte where she competes in Volleyball, Basketball, In-door/Outdoor Soccer and Track. As a grade 12 this year Ashley has been a consistent leader for all of the teams that she is involved with. She leads by example in her strong work ethic, competitiveness and respect for the game she is playing. Ashley helped lead her indoor soccer team to the semi-finals scoring a short handed goal in the game but eventually losing 2-1. That same week she was also leading the Senior Women’s basketball team to the Tier 3 Championship game where she scored 30pts to help her team win the final. 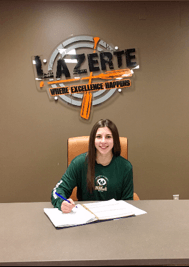 Ashley is an exceptional person, outstanding athlete and honor student and will continue her career into post secondary as she has signed her letter of intent to play soccer for the University of Alberta Pandas next year. Congratulations Ashley, well deserved!